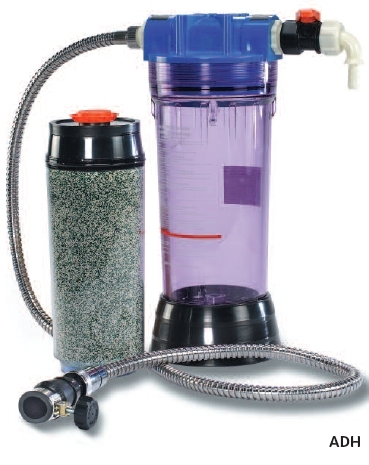 A simple, portable deioniser giving good quality water at an affordable price. The disposable ion exchange cartridges slowly change colour from green to blue as they are exhausted giving at a glance indication of the resin condition. No need for conductivity meters, batteries or mains electrical power. Supplied complete with flexible hose for connection to a tap and a stopcock to control the flow rate. Can be linked in series with the Aquatron filter (page 90) either by a flexible hose or the rigid coupling (ALC) available as an accessory. Ideal as a pre-treatment for Aquatron water stills to prevent scale build up and improve output quality. Housing and ion exchange cartridges must be ordered separately.